An area of Leo Ring gas cloud (blue overlay) shows blue clumps (in circles) that likely represent the ultraviolet emissions of dwarf galaxies in the process of formation. Image credit: NASA/JPL-Caltech/DSS. (PhysOrg.com) -- Evidence of star birth within a cloud of primordial gas has given astronomers a glimpse of a previously unknown mode of galaxy formation. The cloud, known as the Leo Ring, appears to lack the dark matter and heavy elements normally found in galaxies today. The unexpected discovery comes thanks to instruments aboard NASA's Galaxy Evolution Explorer (GALEX) spacecraft which are sensitive to the ultraviolet radiation emitted by newly formed stars. The team, led by astronomer David Thilker of Johns Hopkins University, included Barry Madore and Mark Seibert of the Carnegie Observatories. "This demonstrates the tremendous power of observing the ultraviolet from space," said Seibert. "By discovering star formation in what is likely a new class of dwarf galaxy the Galaxy Evolution Explorer observatory is certainly living up to its name." The Leo Ring, discovered in 1983 by radio astronomers, is a cloud of hydrogen and helium gas orbiting two galaxies in the constellation Leo. The cloud is nearly invisible in optical wavelengths, and since its discovery astronomers had searched for stars within it without success. The launch of the GALEX spacecraft in 2003 with ultra-sensitive UV detectors has made it possible to explore new wavelengths and detect ultraviolet emissions from the cloud's star-forming regions, which the astronomers interpret to be small galaxies known as dwarf galaxies. Previous measurements of the masses and velocities of clumps of hydrogen within the Leo Ring suggest it lacks any significant dark matter component, an aspect that distinguishes these newly discovered sites of star formation from other known dwarf galaxies. Since in current cosmological models galaxies form in association with a massive "halo" of dark matter, this suggests that the new galaxies formed through a distinct and not yet understood process. 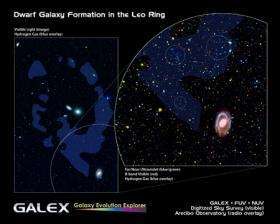 Given the immense size of the Leo Ring it is unlikely that the gas comprising it has been cycled through or extracted from the central galaxies. It is conceivable that this gas has been untouched since the beginning of the Universe. If so, the newly formed dwarf galaxies could be almost pure hydrogen and helium and lack heavier elements ("metals" in astronomical terminology). The Leo Ring and its newly discovered ultraviolet dwarf galaxies would then provide astronomers with a nearby opportunity to see how galaxy formation probably proceeded in the very early Universe. The new type of dwarf galaxy may have been common in the early Universe, when clouds of pristine gas would have been more abundant. The discovery opens a window on the process of star formation in primordial gases not yet enriched with heavy elements. "The next phase is to follow up these objects with deep imaging and spectroscopy from the ground," said Carnegie astronomer Barry Madore, who is a co-author on the paper and a co-investigator on the GALEX mission. "An observing run on Carnegie's 6.5m Baade telescope is already scheduled for this spring." The paper appears in the February 19, 2009 issue of the journal Nature. 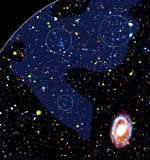 So we are back to the idea that dark matter isn't required for galaxy formation. They have no clue as to how galaxies or stars form. That is becoming more and more obvious everyday. "Maybe this is how it happens..."
"No, no, that doesn't make sense, back to the drawing board." That makes things rather frustrating at times, but still pretty exciting. Too bad this article says little more than "we thought we knew how things worked, but now we don't"
If these dwarf galaxies formed from truly primordial gas, might their stars be representative of the long-sought Population III stars? Spectroscopic & photometric follow-up of these nearby, DM-less systems should prove interesting( starting with the Magellan observations noted in the article). There does seem to be some wiggle room in the press release( That the Leo Ring MIGHT be comprised of unprocessed primordial gas & previous observations SUGGEST that there is little DM in the Leo Ring ). Obviously these assertions must be scrutinized with follow up observations. But this announcement, if confirmed, should be of great interest to astronomers studying Dark Matter and those who study galaxy formation. BTW, anyone have a link to the full paper published in Nature? Oops, read Baade observations for 'Magellan observations'. How do you get that from this article? This article is talking about the discovery of a previously unseen, rare mode of galaxy formation. How does that invalidate our existing model of the more common type of formation? No one ever said that galaxies can't form without dark matter; only that *modern* galaxy formation almost always involves dark matter. I mean, of course primordial galaxies formed largely without dark matter, since the dark matter had not yet coagulated! We've always known this. We just weren't able to *observe* such a galaxy... until now. Likewise, the primordial stars in the early universe are believed to have been very different (and far, far larger) than modern stars. We have yet to observe a primordial type star... but that doesn't mean we think they can't exist. If we ever manage to observe one, will you then be saying that this proves we know nothing about star formation? "Examples that falsify (disprove) The accepted stellar Evolution Process"
"The current picture is that galaxies form inside of dark matter halos," Diemand told New Scientist. The dark matter's gravity attracts ordinary gas, which can then coagulate into stars. "It is unclear how one would form a galaxy without a dark halo, or how one could remove the halo without destroying the galaxy," says Diemand. "A galaxy without dark matter really does not fit into our current understanding of cosmology and galaxy formation."